Los Straitjackets is a Nashville based band known primarily for performing instrumental surf music in lucha libre masks. Members include guitarists Eddie Angel and Danny Amis, bassist Pete Curry, and drummer Jason Smay. They use DiPinto guitars. Angel, Amis and Jimmy Lester formed The Straitjackets in 1988 in Nashville. They played several gigs during the summer of that year, but soon broke up. Angel, Amis and Jimmy Lester formed The Straitjackets in 1988 in Nashville. They played several gigs during the summer of that year, but soon broke up. 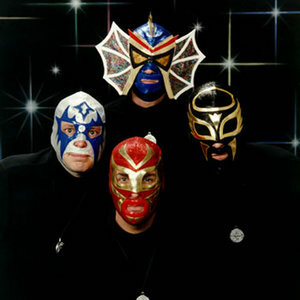 In 1994, they reformed as Los Straitjackets, adding bass player Scott Esbeck. Their first album, The Utterly Fantastic and Totally Unbelievable Sound of Los Straitjackets, was released the following year on Upstart Records. Over the next few years, the band developed a cult following through its tight instrumentation and gimmicky stage shows. When performing live, band members all dress alike, wearing black clothing, gold medallions, and Mexican wrestling masks. Amis is the only member who speaks, introducing songs in fast, badly accented Spanish. In 1998, Esbeck left the band during the recording of The Velvet Touch of Los Straitjackets and was replaced by Pete Curry. In 2005, Lester left and was replaced by Jason Smay. They've become known as frequent collaborators, recording Sing Along With Los Straitjackets with a number of different artists. They were nominated for a Grammy Award for their collaboration with blues singer Eddy Clearwater, Rock 'n' Roll City. As time goes on, their stage shows have grown more and more elaborate. They frequently feature elaborate choreography, guest vocalists such as Clearwater and Big Sandy, and burlesque dancing troupe The World Famous Pontani Sisters.